Zombies could work, and maybe the tunnel half submerged in water, and abandoned cars and maybe a bus or two. 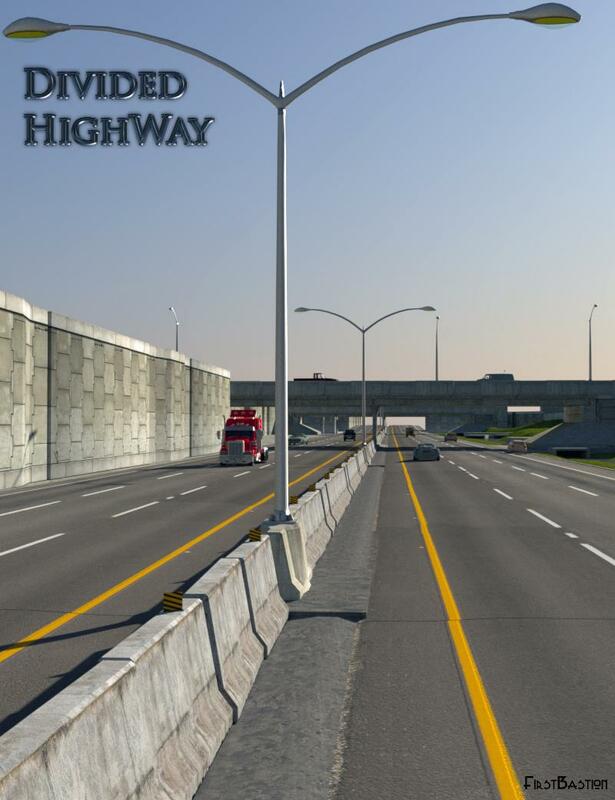 Here's a Reality render for the Divided Highway. And as always since the scene is props based, you can move and remove many of the elements. Like guard rails and noise barriers. Thanks for the support. I'll see what I can do with a curved section and off ramp. I've got Divided Highway. Thanks for making it. I don't understand why you didn't do a promo overlooking the bridge. Great job, mate. I haven't had a chance to play with Tunnel Traffic, yet, and Divided Highway will be downloading as soon as DIM figures out that there is something new ready to download. Its just spinning its wheels right now. Hopefully, I can set something up for one of them to render before I take my youngest to the movies here in a bit. If I may ask, where'd you get the police car used in the Divided Highway promo pics? It doesn't appear to be the same police car sold at the Daz store. Hi it is Stonemason's City Ruins Vehicle police car, the clean version. There is no promo for it on the daz store page but it is in the package. I have to hold off buying stuff this week or it would be in my cart already, I have the Vehicular Tunnel traffic set, it appears I can reverse the cars for Australia on the Highway, that is my main consideration with any street set. I can appreciate that. The traffic signals in the tunnels, hanging from the ceiling are individual props so you could rotate them, but it may be less work to go into the Textures folder and swap the names for the arrows and Xs, since they are separate image files the conversion would only take a few minutes and then the flow would be reversed. It took awhile to set up and then 2 days to render, but I finally managed to get something I liked for my first render with Divided Highway. I hope you like it. I had to learn a new postwork skill because I couldn't quite figure out how to do motion blur inside DS. Another thing to add to my need to learn list. Clicking on image should go to gallery page to see full size image. Looks good. Might there be a bandstand off to the side by any chance? It's always great to learn new skills. We're all constantly learning especially in this ever evolving 3D realm. That's a particularly hard angle to get 2D post work blur to lineup with the motion of the scene. Now if you could get motion blur inside DS, that would be very cool. It's not something I have tried. But if you figure it out I'd like to hear how its done. That works for 3Delight; Iray motion blur in DAZ Studio is...well, to the best of my ability to tell, it's not possible yet. I decided to focus on the talk show set itself and included 60+ host-guest interaction poses, ( meet, greet, talk, monologue, interview ) stuff like that. It does included a larger studio space surrounding the scene, so there is room to add an additional stage at some point. Thanks for the info. One more question: Is the show sign/logo a separate prop? One more question: Is the show sign/logo a separate prop? Yes it is a separate prop, it can be moved, removed, hidden or retextured. Gracias. 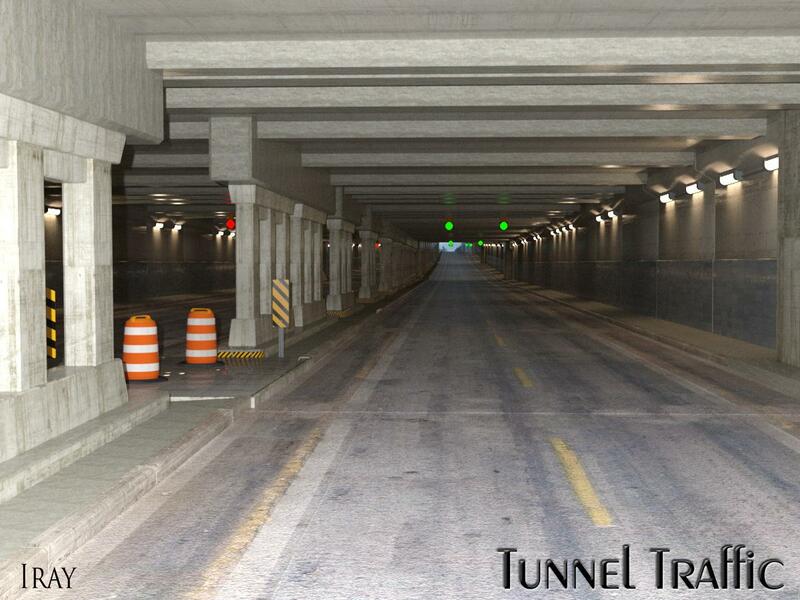 BTW, you nailed Tunnel Traffic and Divided Highway. Thank you so much. 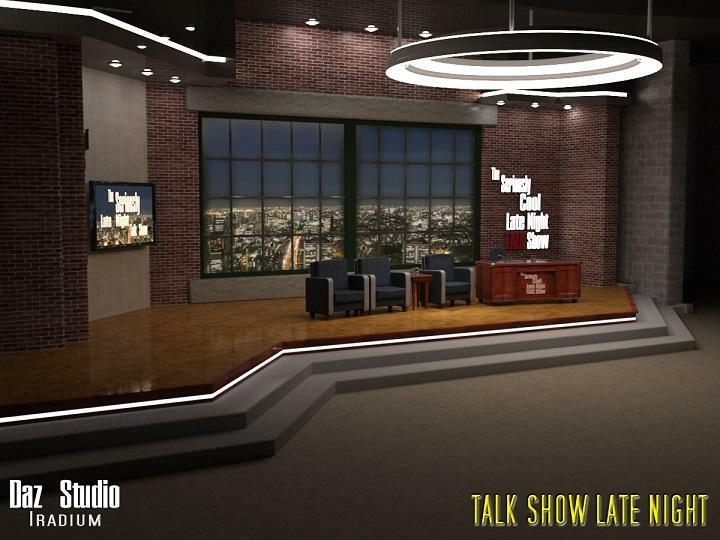 The Talk Show Late Night Set and Poses Available Now. Includes the scene, 60 full body everyday type sitting, standing, talking, monologuing, interacting type poses, another 12 partial facial expression talking poses as well as head turned poses, that are set up to be cumulative, expressions plus the head turn plus the body pose. Plus there's resets too. The guest chair also has built in squish and sitting morphs to make realistic posing a lot easier. Plenty more promo images on the store page. But: Why? Why? Why? Genesis2 Poses! It has Genesis 2 poses? Wow, that's great! So many of the new products only have poses for Genesis 3, even though we still have a lot more Gen 2 characters than Gen 3 ones. +1 for the G2 poses. I mean, there's a working conversion from G2 to G3, but so far I know of no way to do the opposite.